So, you are moving into a new home or remodelling, and you want your kitchen to be the epitome of modernity. 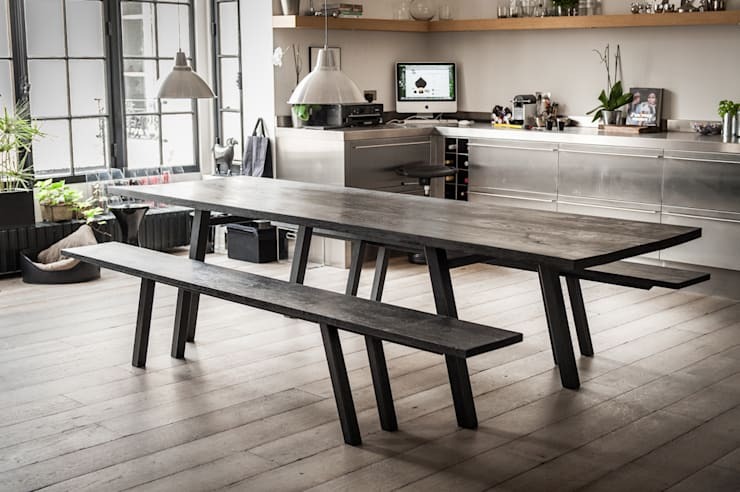 This is not too tall an order since the perfect modern look can be achieved by using various different materials for your kitchen counter tops and work spaces. 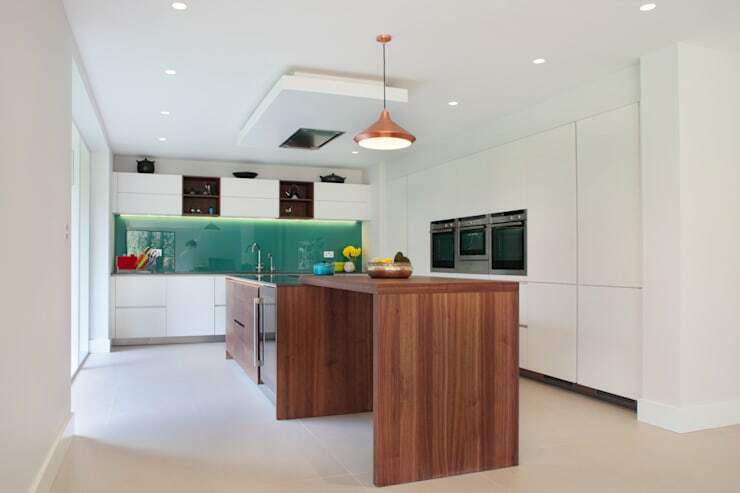 There are a few things to consider when choosing a material for your new modern kitchen worktops, like your project budget, the type of style you are going for and the quality-price ratio suited to your needs. When we get past the multitude of brand names, we are actually just left with a few material options. But the list is far from limited. Let's take a look at our candidates! Plastic laminate have been around in kitchens and homes for an admirable amount of years. Rightly so, since it is extremely durable and hard-wearing. This material is surprising in its resilience, since it is made simply of kraft paper and resins. You can hardly believe that this once fallible materials are transformed into this tough and valued surface. You have endless colours, patterns and textures at your disposal when it comes to laminate counter tops, but for this purpose only matte and fine matte finishes should be considered. Also make sure to ask for only general purpose laminate, since the other option—vertical grade laminates—are not suitable for kitchen counters. The con of laminate counters is that it is prone to scratching, stains and burns. In some case of water exposure and general wear, the layers of a laminate counter can start peeling. This can be difficult to repair. Laminate is, however, by far your most affordable option, which means you can easily afford hiring a professional cabinetmaker to install a custom counter to your specific instructions. This will be your best option on a tight budget. 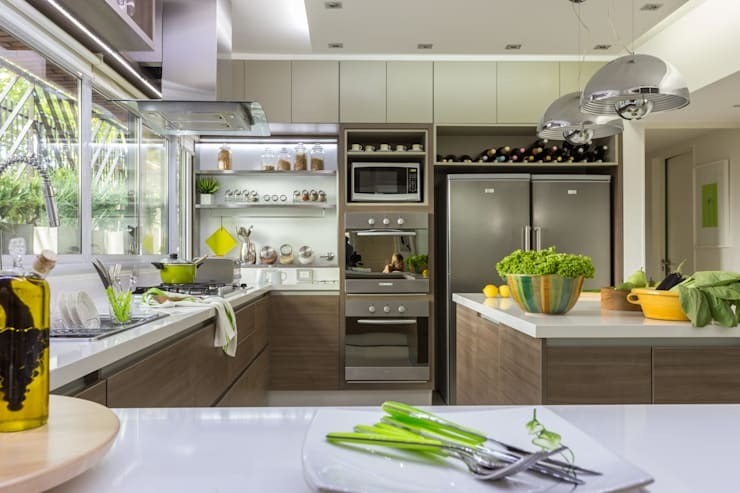 Traditionally confined to commercial kitchens and working spaces, but it has become an ever-increasing popular trend in residential kitchen over the last two decades. There are numerous pros to installing steel counter tops in your kitchen. A steel counter top will be tailor-made to your specific kitchen, ensuring that you have a custom look. What's more, stainless steel counters are practically indestructible, and is highly resistant to heat and bacteria. It is the perfect material if you are going for an industrial-style kitchen. The downside to installing stainless steel counters is that it is extremely expensive due to its custom installation. Furthermore, maintenance can be a burden, as it can dent easily and will be negatively affected by certain chemicals. It may look sleek and modern, but it will be quite a bit of money and effort. Wood counters are probably incomparable in natural beauty. It is typically constructed of rock maple, teak, cherry, walnut (pictured) or oak wood. Wood counters have lost popularity over the last several years, primarily due to the increasing popularity of stone and solid surface counters, but also to the myth that wood counter tops harbour germs and bacteria harmful to food preparation and hygiene. Treatment of wooden counters can be a bit tricky. To maintain and enhance the natural beauty of a wooden counter, most people opt for treating it with a mineral oil. The draw-back of this is that it needs to be reapplied every four to six weeks. For this reason, wood is best suited as secondary worktop material, such as for a butcher's block or a kitchen island. If you are set on wood counters though, go for the alternative of a polyurethane sealant, which will buy you a few years. Natural stone has been favoured for its luxurious appearance and hint of opulence it brings to ordinary kitchen. It has become more available and more often utilised in contemporary times, increasing the possibilities for its installation. The most popular natural stone traditionally used for kitchen counter tops are granite, slate and soapstone. Granite is by far the most often employed of these. These days it is less expensive than the days of its popular debut, and it is available in wide range of interesting colours. A benefit of granite tops is that it is cut into single, seamless pieces, which are then treated by a durable sealer. This treatment will last as long as 10 to 15 years with little more maintenance than the use of a stone top non-abrasive cleaner. 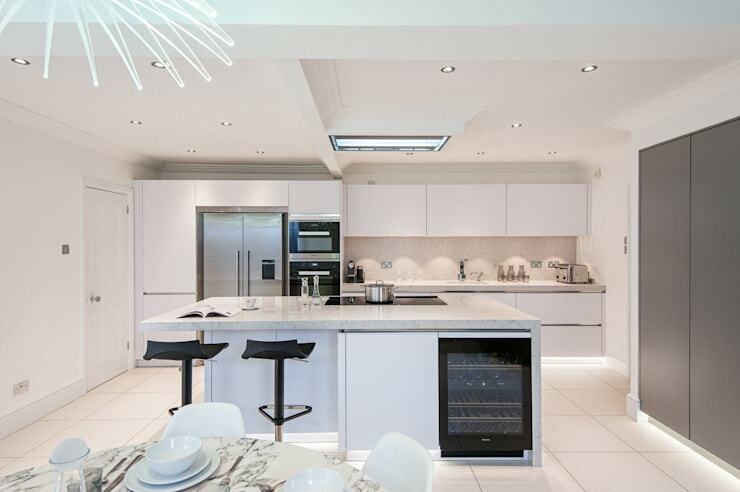 Your alternative to natural stone worktops is Quartz. These counters are made by about 90% ground natural quartz combined with polymers, resins and pigments to simulate a natural stone surface. The benefit of this is a cheaper material with the same look and feel of natural stone. Quartz is also more flexible than natural stone (like granite), whilst being just as strong. The biggest benefit of Quarts is probably that it is very durable whilst being non-porous and requiring no sealant, ever! This will save you endless money and effort in maintenance, whilst still providing a beautiful, classic look. Quartz counter tops are available in a wide variety of colours, but should be installed by a professional. When it comes to solid surface counters, Corian is the way to go. Corian was patented in the 1960's a trademark of DuPont, and widely available across the globe. It consists of a blend of acrylic and polyester materials, which make it resistant to scratches and stains. What's more, it is a material that's entirely repaired or renewed without much effort. The seams of these tops are fused together, in order that the junctions are invisible to the naked eye. There is literally no limit to the options for colour and pattern. 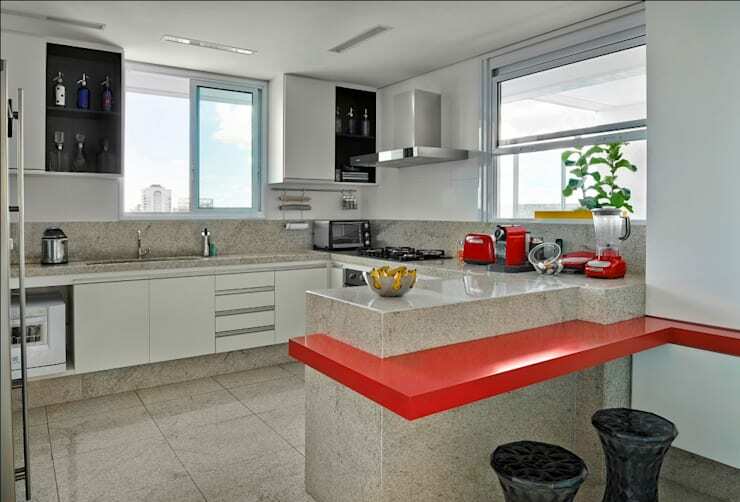 Unfortunately, Corian can be easily damaged by heat and denting. It will cost you more than laminates, but is still a cheaper option than stone, steel and quartz. Dekton is a contemporary innovation which has gained momentum in kitchen design over the last couple of years. Dekton manufacturers make use of a process which they call Sinterized Particle Technology, involving subjecting natural stone to high pressure and temperature, simulating the natural process that takes thousands of years. Dekton is highly resistant to scratching, stains, heat, abrasion and thawing. It is definitely a great option if your budget is a little more lenient and you are looking for a high-quality, ultramodern alternative. Take a look at AD3 Design, a homify professional who provides beautiful kitchens with Dekton worktops. Once you've settled on a material for your counter tops, for further modern kitchen design inspiration, check out: 5 Spectacular Modern Kitchen Designs. Which material do you think would best work in your kitchen? Let us know!